If you are looking for a short trek in Ladakh and don't want the crowds of Markha then the five day route from Shang Sumdo to Rumbak is extremely attractive. 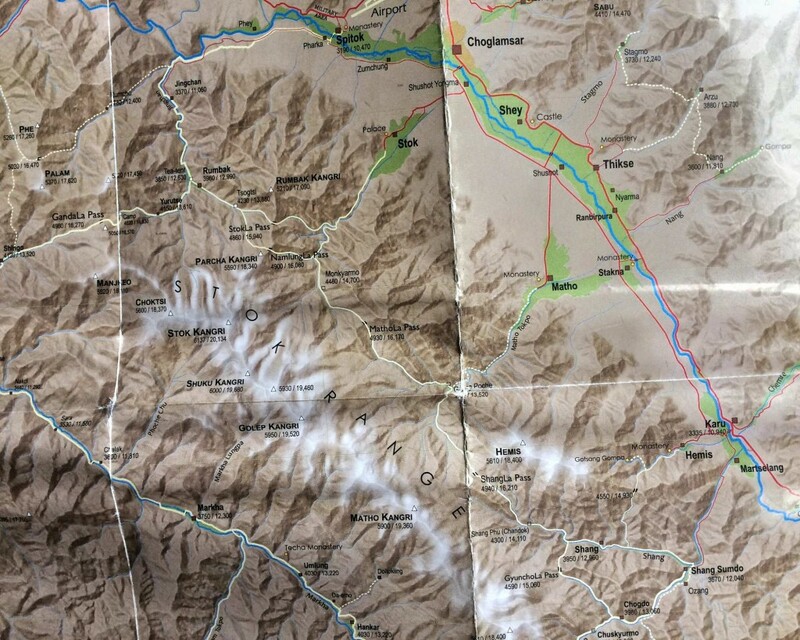 The route walks in the shadow of the Matho Kangri and Stok Kangri peaks with typical rolling grasslands, fast flowing rivers, wildlife and nomadic settlements of sheep and yak. The trek approach is close to Leh making this an ideal one week vacation. Who should join this trek? A good choice for regular hill walkers, moderate level of fitness required. Prior trekking experience is advisable as it is a camping trek. 1) Walking times: average 5 to 6 hours walking per day. 2) Altitude: up to 4,940 metres at the passes and around 4200-4400 metres at the campsites. 3) Terrain: for some of the time following well-travelled trails although also likely to encounter rough and rocky conditions near the passes. 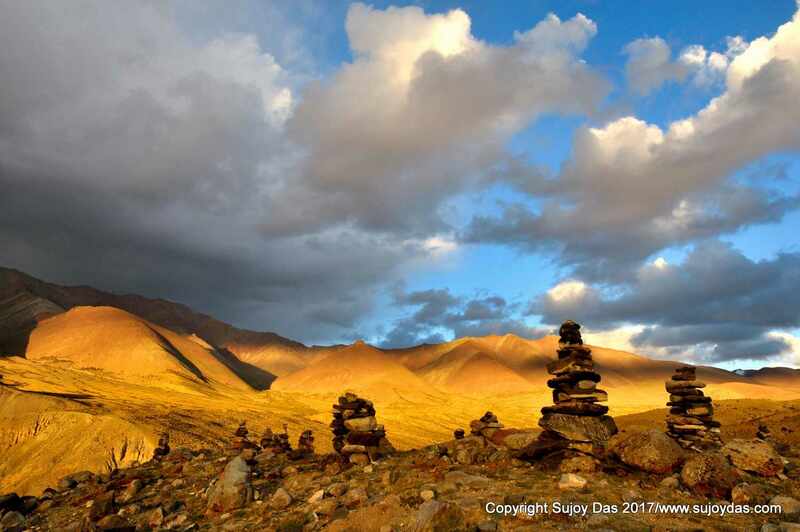 4) Remoteness: the trek is in a remote mountain area but not far from the roadheads at Shang Sumdo, Matho, Stok. There is no mobile phones and wifi connectivity on the trek. Day 1 Fly in from Delhi to Leh and rest for the day. Day 2 Acclimatisation rest day - visit monasteries in and around Leh. We drive from Leh to Shang Sumdo and reach in about 90 minutes. 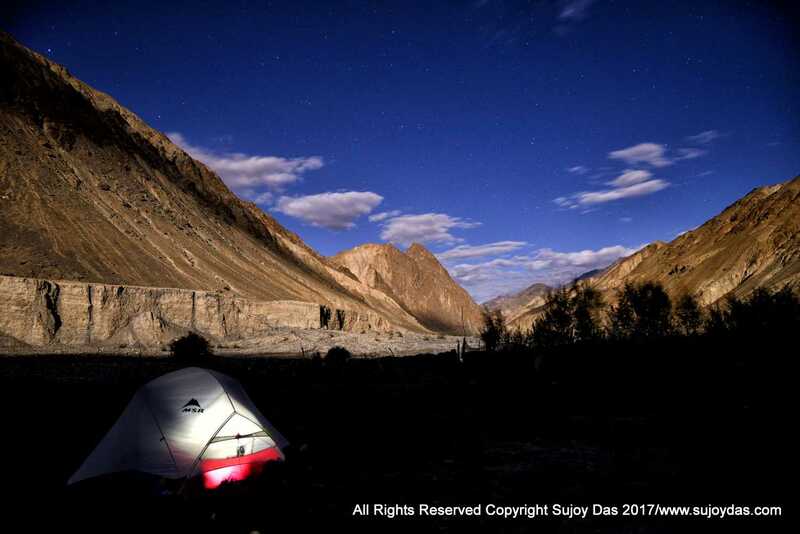 We camp near the river and spend the day acclimatising in and around Shang Sumdo. This second acclimatisation day will help us in our future days. We start our trek today - our ponies are waiting for us here and after breakfast we start our first days walk. Today the trail ascend gradually through green fields of wheat and barley following the Shang river, flowing from south of Matho Kangri.The valley heads up a shepherds hut the grasslands around serve as grazing grounds fro yak, sheep and goats. We camp overnight at Shang Phu. There is no pass to cross. 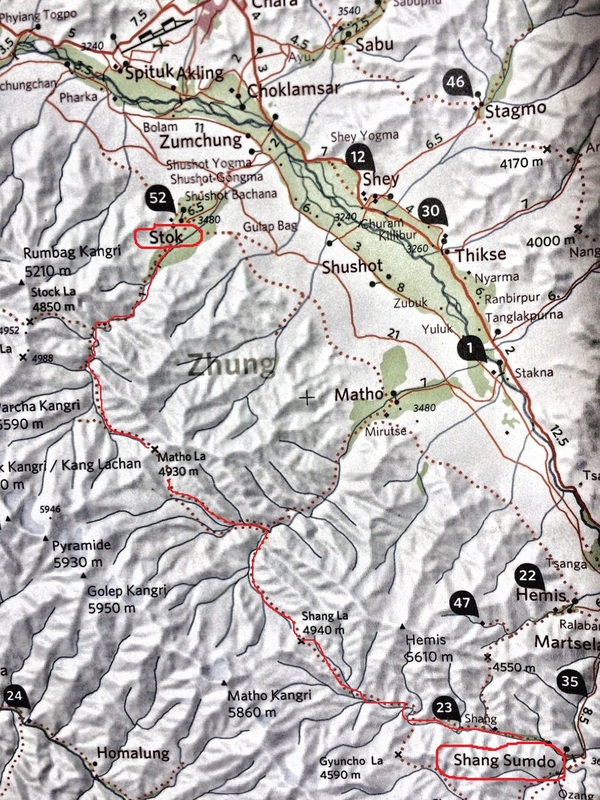 The day begins with a long three to four hour climb to the Shang la through a zg zag trail. This area is home to snow leopards, bharal, marmots, golden eagle and a lot of other bird life and wildlife. The view from the top is impressive with the mountain wall of Matho Kangri 5900m just behind and above the pass. The path then descends gradually to the campsite of Gangpoche. This trail travels across the Gangpoche meadows until it reaches the base of Matho la 4350 metres. It then climbs the gentle slopes to the top of Matho La our second pass. The trail steadily ascends to a series of grassy slopes, Yak herders from the nearby villages live in stone settlement at the foot of the pass and the view from the pass is absolute amazing , the popular Stok kangri peak right behind. From the top of Matho La is descends gradually for around 3 km to the campsite of Mankarmo 4480m. Day 7 Mankarmo 4480m to Rumbak 3900m across Stok La 4900m 6 to 7 hours. Today we have a hard climb to the top of Stok La which has a spectacular view - this is our final pass and then we descend gradually to the the village of Rumbak. We stop for a snack at a tea tent in Rumbak and then walk one hour down to the road head where our transport is wating drive us back to Leh 2 hour drive. The cost of the trek is Rs 55,000 /- for Indians (US $ 1100 for foreign passports ) Leh to Leh - some exclusions apply. Costs given above are at current rates of 2018 and may change without notice. Changes if any will be notified 3 months before the trek. Transfer by vehicle from Leh to Shang Sumdo (day 3) and pickup from below Rumbak village (day 7) at the end of the trek. Three nights accommodation in Leh on twin sharing basis in a good standard hotel. All accommodation in tents and meals on trek for five days (day 3 to day 7) as per itinerary; breakfast, lunch and dinner. Cost of guides/cook/helper/ponyman and ponies as needed for the trek. Flight Costs from home country to Leh and back. All meals in Leh not covered. Client travel and medical insurance of any kind. Emergency evacuation costs if needed. Personal clothing and equipment; sleeping bag; duvet /down/ goretek jacket, medicines for personal use etc. Present cost of air ticket Delhi – Leh – Delhi ranges between Indian Rs 12,000 to Rs 18,000 return. Early bookings will attract lower fares. Some airlines flying to Leh from Delhi are Jet Airways, Air India and Go Air. 1 Duffle Bag All the equipment listed below other than what you need for the day should be packed into a duffle bag, locked and handed over to the porters in the morning. In case you cannot get a duffle bag in your home country these are available very cheap in Kathmandu and I can help you with this. The duffle bag should not weight more than 10 kgs! If due to illness or any other reason a client has to leave the group and go down or wait at a lodge for the group to pick him/her up on the way back or return to Leh, all expenses including lodging, fooding, transport and any porter/guide related expenses if any are to be borne by the individual client over and above the trek fees paid for the trek. There are also no refunds for leaving a trek before completion. In the event of injury or illness South Col Expeditions (Sujoy Das) or its Staff can, at the clients cost arrange any medical treatment and emergency evacuation service as it or they deem necessary for the health and safety of the client. You will need to sign the waiver of liability and release form prior to commencement of the trek.